By Steven N. Austad, Ph.D.
Scientific Director – American Federation for Aging Research; Director – Nathan Shock Center of Excellence in the Basic Biology of Aging, the University of Alabama at Birmingham; Principal Investigator - the Nathan Shock Centers Coordinating Center. What is aging? In the broadest sense, aging reflects all the changes that occur over the course of life. Over centuries, theories about aging have emerged and faded, but the true nature of the aging process is still uncertain. The fact is, aging is a part of everyone’s life. But the facts of aging—what is happening on a biochemical, genetic, and physiological level—remain rich for exploration. This article introduces some key areas of research into the biology of aging. Each area is a part of a larger field of scientific inquiry. You can look at each topic individually, or you can step back to see how they fit together in a lattice-work, interwoven to help us better understand aging processes. Research on aging is dynamic, constantly evolving based on new discoveries. In our bodies, aging is a series of interconnected processes. As the field of biomedical research on aging has grown over the past three decades, “hallmarks of aging,” have emerged. On a cellular level, these processes or “hallmarks” are considered the core underlying machinery of how our bodies age. Epigenetic Alterations. Your genome is more than a long sequence of DNA letters. DNA strands are wound around spools of protein called histones, and both DNA and histones can have various chemical handles, cranks, and levers attached to them to help turn genes on or off. These handles, cranks, and levers comprise your epigenome. Your epigenome changes as you age--levers are lost, added inappropriately, or shifted around. As a result, precise coordination of gene activity can be compromised. One particularly well-studied group of molecules than influence the epigenome is the sirtuins, molecules that remove one type of epigenetic handle. Interestingly, your epigenome can be modified by diet, other lifestyle factors, and pharmaceuticals. Evidence that the epigenome affects aging comes mostly from the study of yeast, worms, and flies. However, dietary restriction in mice slows epigenetic changes, and when mice are made deficient in one of the seven mouse sirtuins, they show signs of accelerated aging. Moreover, when that same sirtuin is superabundant, male mice live longer. Loss of Proteostasis. The main job of genes is to make proteins, which are the heart and soul of cells’ biology. Proteins regulate virtually all chemical reactions and provide cell structure. Protein homeostasis, or proteostasis, is the maintenance of all proteins in their original form and abundance. In order to perform their duties, proteins must be folded in precise, complex shapes like origami. However, with age proteins are damaged by normal cellular process and when damaged begin to misfold. Misfolded proteins not only fail to perform their normal job, they can clump together, and become toxic. Alzheimer’s disease is an example of an age-related disease caused by protein misfolding. The importance of maintaining proteostasis can be seen in the elaborate cellular systems for maintaining it: there are specialized molecular devices to repair and refold damaged proteins as well as to degrade irretrievably damaged proteins and replace them. Several pieces of evidence highlight the role of proteostasis in aging: misfolded proteins increase with age;protein misfolding occurs in the brain and muscle of Alzheimer’s patients; both genetic and drug-induced enhancement of protein quality control will extend life in mice. Deregulated Nutrient Sensing. When nutrients are abundant, animals including humans grow and reproduce--the evolutionary imperative. When nutrients are scarce, evolutiona has designed animals to focus on maintenance and repair. Studies have been designed to inhibit the signaling of nutrient abundance in three ways: 1)by actually reducing food, 2)by fooling the body into thinking fewer nutrients are available, with drugs such as rapamycin, and 3)by inhibiting the signaling of insulin or its close relative, the insulin-like growth factor. All of these strategies enhance health and longevity in mice and other species. Mitochondrial Dysfunction. Mitochondria--often called the “powerhouses of the cell”--are places where most of your cells’ energy is produced. Unfortunately mitochondria also produce most of the free radicals, or as scientists more commonly refer to them, Reactive Oxygen Species or ROS in your cells. As ROS damage nearly any molecule they touch, for many years it was thought that ROS were the major culprit behind aging and that minimizing them would lead to longer health and life. However, in the past decade, it was discovered that sometimes lowering ROS had no impact on health. Moreover, sometimes actually increasing ROS, by inhibiting mitochondrial function, seemed beneficial. The newer thinking is that ROS are important in signaling cellular stress. Cells, organs, and tissues that sense stress increase their maintenance and repair processes in response to the stress. Current thinking suggests that ROS production should be in a Goldilocks zone, not too much, not too little, just the right amount. Cellular Senescence. Cells that once replicated vigorously but have now entered a permanent nondividing state are called senescent cells. We accumulate senescent cells with age. Alas, these cells do not die. They persist and secrete damaging molecules into the surrounding area. Telomere attrition is one cause of cellular senescence, although other types of damage can also trigger this state. For years, it was debated whether senescent cells contributed to aging or were simply a protective mechanism against the development of cancer. Recent work, in which mice were genetically engineered so that researchers could eliminate many of their senescent cells, has clearly shown many health benefits, including longer life. Work is now underway to identify drugs that target senescent cells for destruction. Stem Cell Exhaustion. The ability of our tissues and organs to regenerate and repair damage is critical to maintaining health. Our bodies’ ability to regenerate tissues and organs depends on healthy stem cells--the ultimate source of new cells--in virtually every tissue. Healthy stem cells must replicate when required, but not otherwise. The replication ability of stem cells--and their ability to replicate only when needed--declines with age. Several labs have now shown that stem cell function can be resuscitated by external factors such as the as-yet-unidentified rejuvenating factor(s) found in the blood of young mice or humans, opening the door for possible pharmacological prolongation of stem cell health. Altered Intercellular Communication. Although a number of other hallmarks of aging focus on processes that lead to deterioriation of our cells, appropriate communication among cells and tissues is also important to maintaining health. Hormones, for instance, are one way cells communicate. Hormones produced in the brain alter the way cells behave in the rest of the body and vice versa. Your liver might chemically tell your brain to reduce hormone production or nerve cells that signal pain in your toe can chemically alert your immune system in the rest of your body. In relation to aging, perhaps the most important loss of appropriate communication in our bodies is the low-level, chronic inflammation that occurs as we grow older. In youth, inflammation is mainly a response to injury that is turned off once the injury heals. In later life, low-level inflammation is not injury-related, but constant. Moreover, this inflammation is damaging to surrounding tissue. Although the cause of age-related inflammation is unclear, considerable evidence points to senescent cells as the culprit. Restoring proper intercellular communication could extend health by reducing chronic age-related inflammation. Additionally, investigators are studying how intercellular communication influences the rejuvenating properties of young blood; studies lend evidence that the blood of young animals contains molecules that can actually rejuvenate damaged heart, brain, and muscle in older adult animals. Genomic Instability. Each cell in your body--except your red blood cells--contains the string of 3 billion DNA letters that defines your individual genome. Proper functioning of your genome is largely responsible for the smooth running of your body. However, your genome is under constant attack from both external sources such as radiation or pollution and internal sources such as oxygen free radicals. By one estimate the DNA in each of your cells is damaged up to 1 million times per day. Fortunately, DNA also encodes a number of processes that detect and repair virtually all of this damage. Still, repair is not perfect and as we age damage to our genome accumulates. Cancer is one result of unrepaired DNA damage. In both humans and mice, individuals with compromised DNA repair processes show multiple signs of accelerated aging and that therapies such as dietary restriction reduce the rate of DNA damage accumulation: this gives evidence that genomic accumulation is fundamental to aging. Telomere Attrition. One specific type of genomic instability is telomere attrition. As it has received considerable individual attention, it will be mentioned separately. Telomeres are repetitive sequences of DNA that protect the ends of chromosomes and prevent them from being mistaken for broken DNA strands. Telomere attrition, or shortening, is a specific type of DNA damage to the ends of chromosomes. Normal cell division shortens telomeres as do other processes that damage DNA. When telomeres reach a critically short length, cells sense it and permanently turn off their replication machinery. An enzyme called telomerase, which is turned off in most adult cells, can prevent telomere shortening and even restore telomere length. Evidence linking telomere attrition to aging is that telomeres shorten with age in both people and mice. Mice genetically engineered to lack telomerase have shown some symptoms of premature aging, and mice engineered to express higher levels of telomerase than normal have been reported to live longer. As biomedical research on healthy aging continues to evolve, these hallmarks provide a foundation for our knowledge of the basic biology of aging. A 2013 article in Cell, “The Hallmarks of Aging,” first framed these hallmarks. Download the article here. 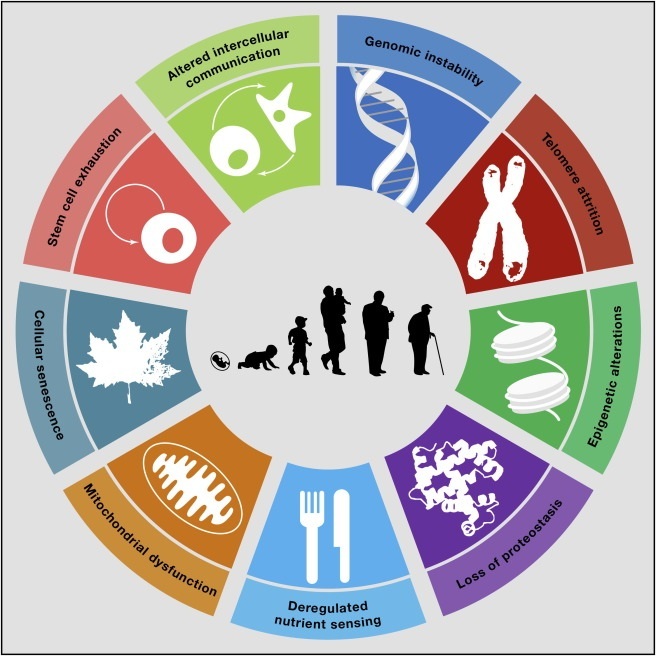 A 2014 article in Cell, “Geroscience: Linking Aging to Chronic Disease,” complemented this research by explaining the relationship between the processes of aging and major age-related diseases—a paradigm known as geroscience. Download the article here. For further reading about geroscience, visit here.